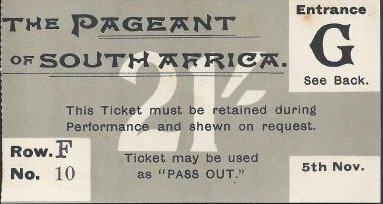 What is a Pageant ? 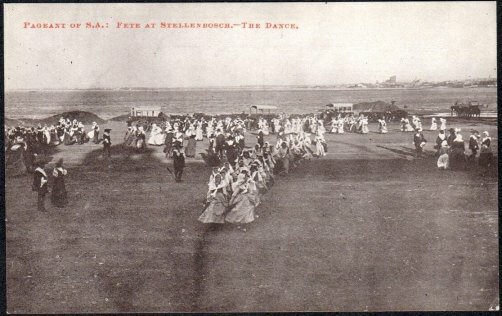 At the meeting of that Committee (to which Councillor Drake was for the special purpose associated), held on the 19th July, the mode of celebration was discussed, and to the Town Clerk, Mr J. R. Finch, was left the task of reporting on a suitable programme. 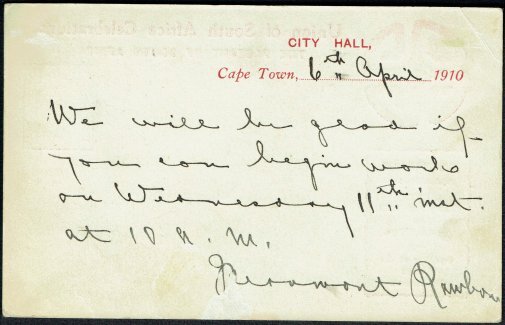 After strenuous labours Mr Finch evolved a scheme which was submitted to the Finance and City Lands Committee on Tuesday October 12th, and the report whereof occupied several columns of the Cape Times on the following day. 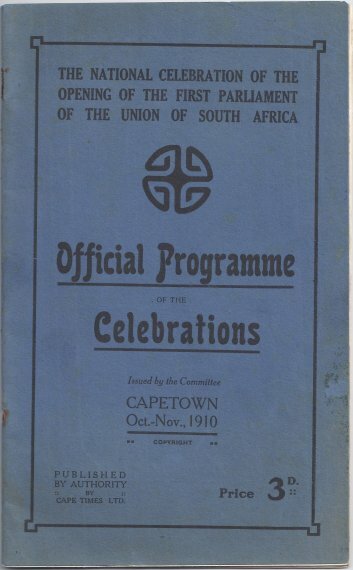 In this report Mr Finch suggested that the Corporation should make an effort to include as a special feature of the celebration of Union, an Historical Pageant of South Africa, supporting his suggestion by forcible arguments, and pointing out the rich array of incidents in the History of this Country which could be represented in such a Pageant, and the means of educating and cementing the various elements of which our white population is composed which such a Pageant would undoubtedly be. 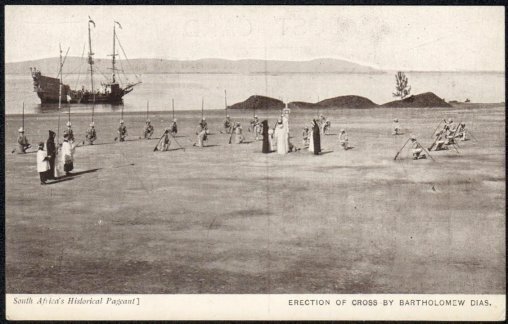 In discussing the site he brought forward all the advantages offered by the foreshore, and even went so far as to give a first sketch of such episodes as he thought the Portuguese, Dutch and English periods might lend for dramatic representation. 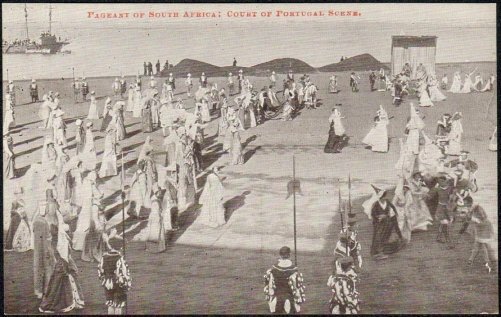 He pointed out that the Portuguese and Dutch authorities might be of great assistance in working out details, and added: The Pageant programme would, of course, extend over several days and certain days might be devoted to one particular period. 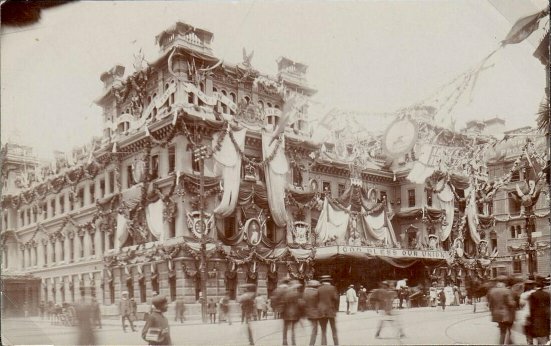 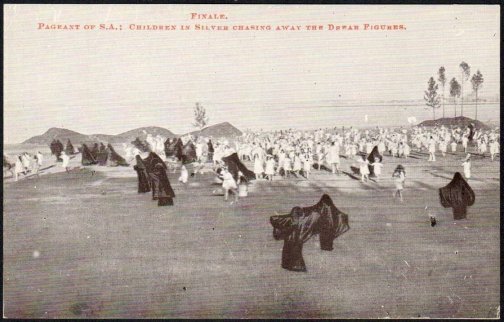 ‘The final celebration of the Pageant, when all periods would be grouped, should take the form of a public display along some of the streets of the city. 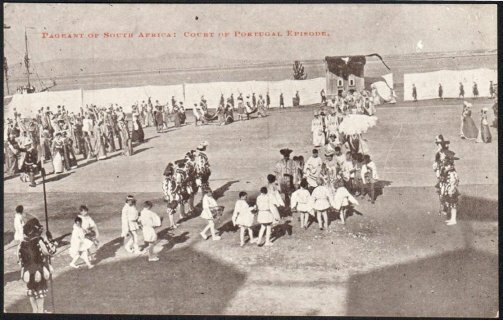 He dwelt upon the absolute necessity of co-operation on the part of the citizens and said that it would be advisable to form Committees for the purpose of considering the various details. 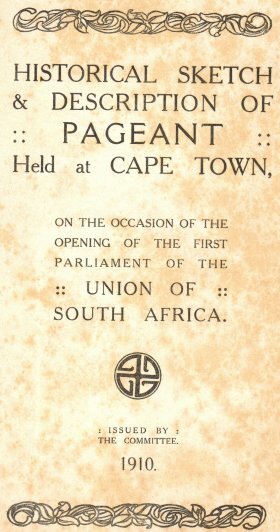 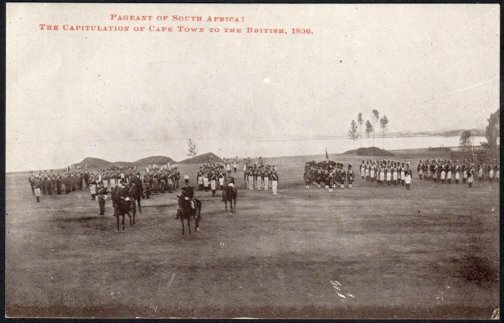 Discussed a programme of Festivities and the manner of receiving the Royal personages to whom would be allotted the privilege of opening the first Parliament of the Union of South Africa, and, in addition, gave several valuable hints onother matters connected with the proposed celebration. 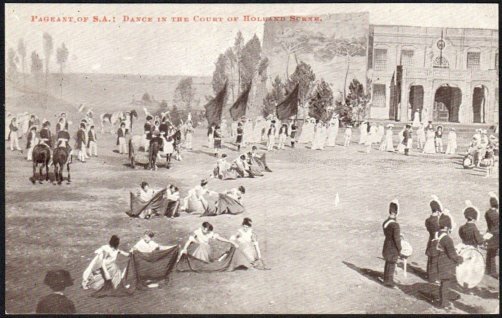 Sub-committees, to which were entrusted the consideration of Finance; Site, Buildings and Seating; Historical Incidents and Episodes; Costumes and Properties; Advertising and Publication; Music, and so forth. 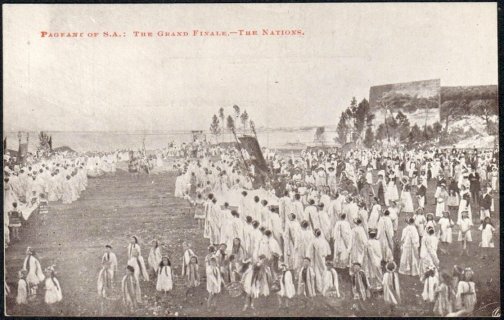 The suggested representations were discussed by the Historical Incidents and Episodes Committee, and finally a scheme was approved of which would have extended the Pageant up to four days. 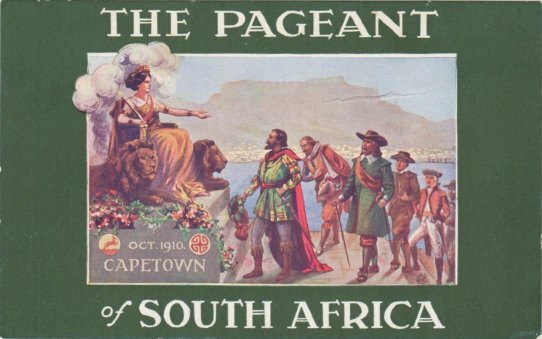 This was subsequently modified by Mr Markoe, the assistant of the Master of the Pageant. 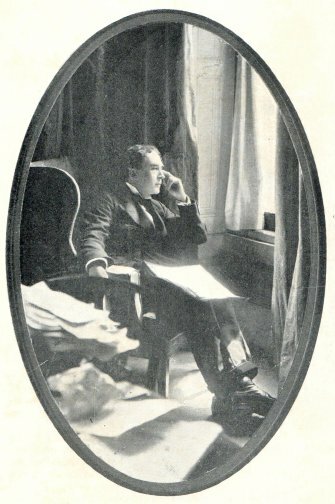 Mr Frank Lascelles, and slightly altered on the arrival of the latter who, owing to the successful manner in which he had conducted the Quebec Pageant, was unanimously selected as such Master, so that the scheme as now proposed embraces a Pageant of two days, the first consisting of eight and the second of nine episodes - Suffice it to say that the Pageant is a national one, and deals with the History of each of the Colonies forming part of the Union. 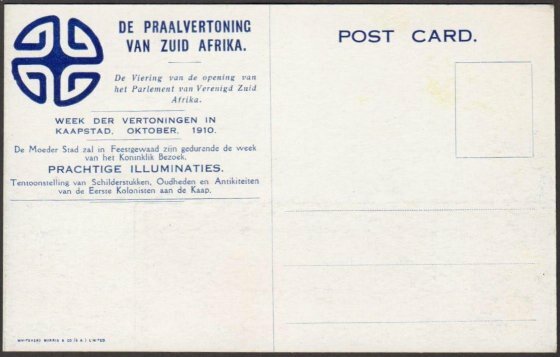 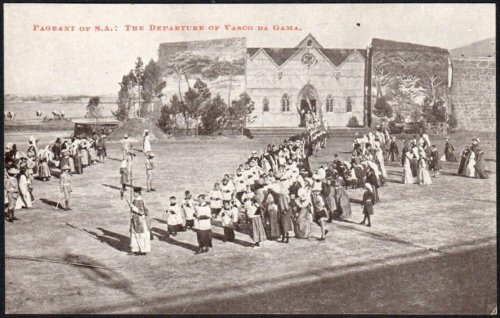 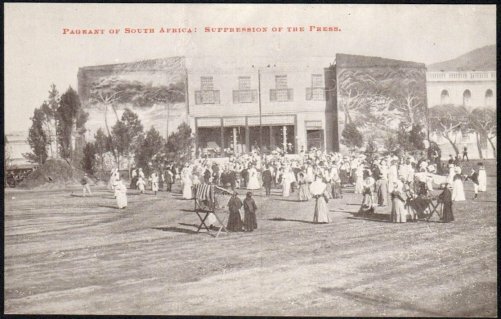 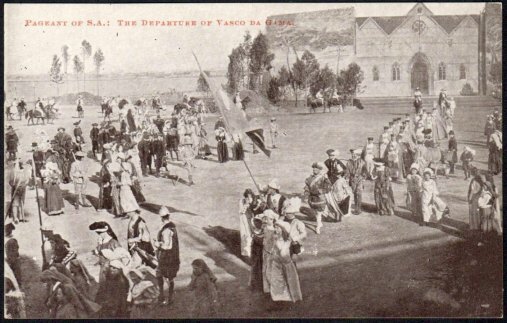 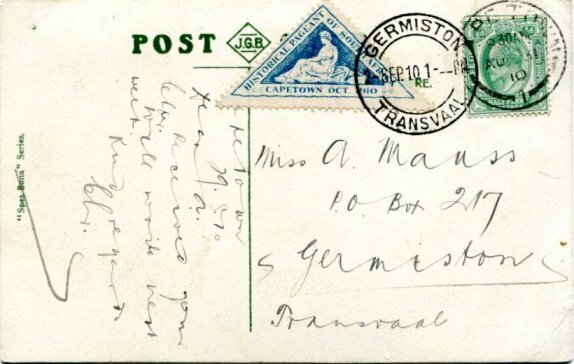 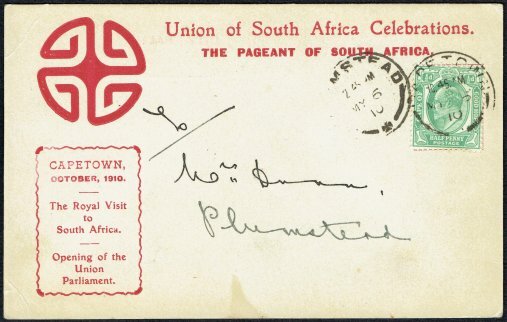 For various reasons which will be easily understood the last sixty years have not been included in the period dealt with, more especially as the intention of the Pageant is to cement together, to obliterate points of difference, and to make all our fellow-countrymen feel that, whether they come from the Transvaal, from the Orange Free State, from Natal, or from the Cape Colony, their ancestors have all had a hand in the making of his country’s history, and that the work of these makers of history should be respected and honoured by all, as without it the probability of Union would have been small indeed Each contributed in his measure, and each should reap his reward. 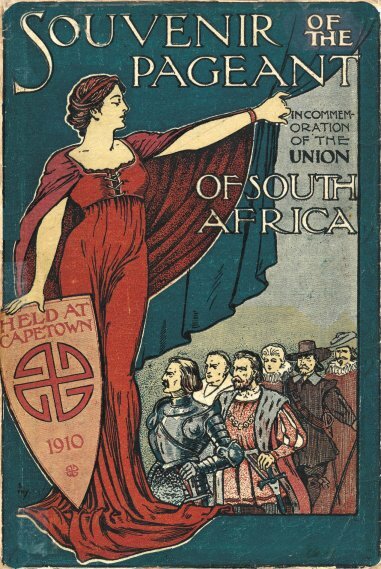 The work of organisation has been conducted on a broad and liberal basis - Committees have been established in various parts of the Union and the co-operation of all races and classes has been secured. 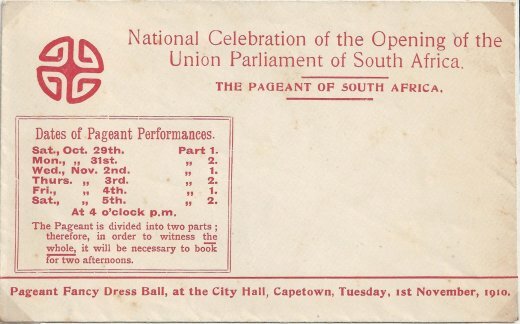 It is estimated that, all told, some 5,000 performers will take part in the show. 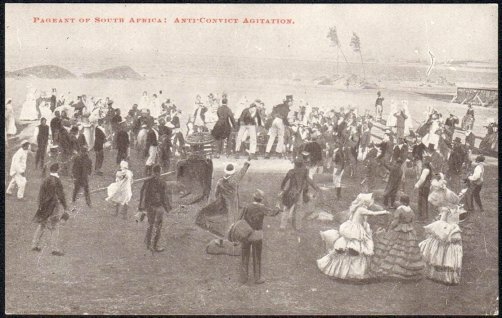 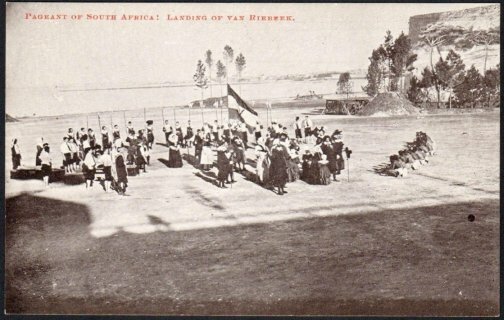 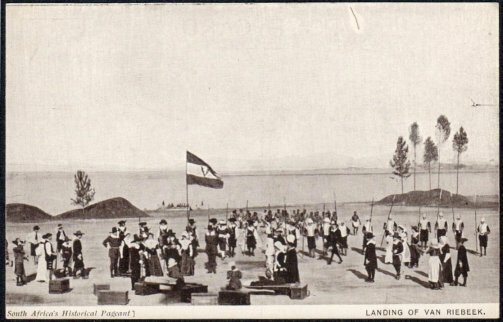 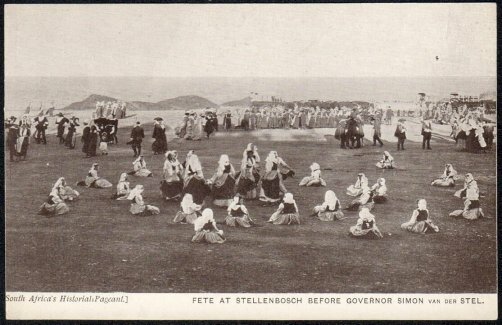 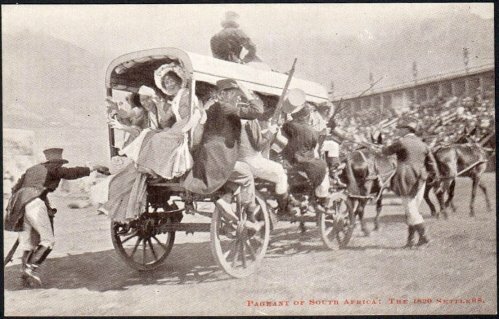 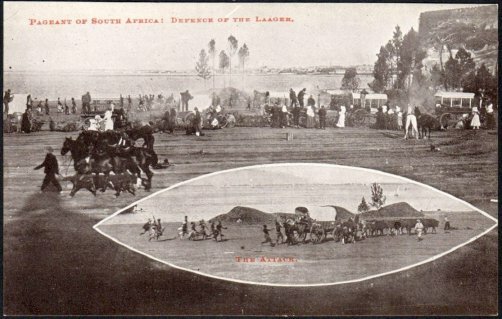 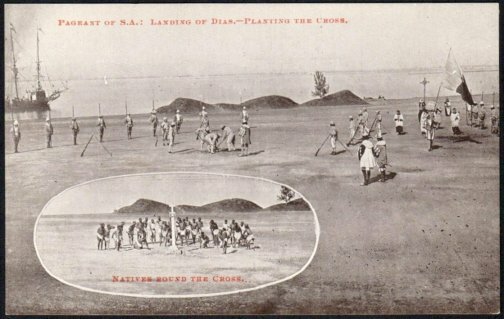 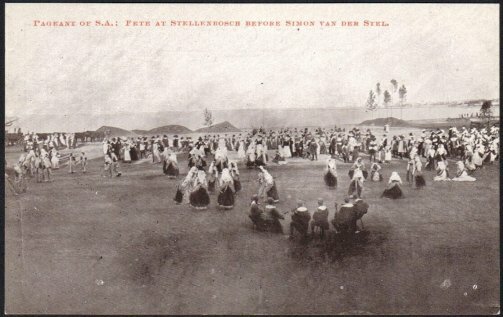 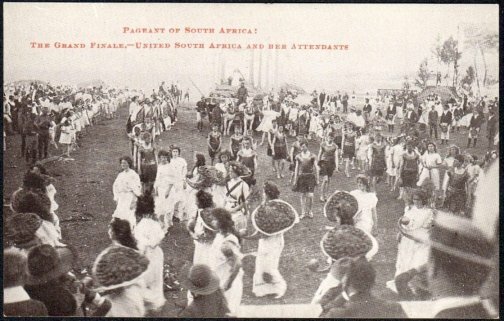 The performers belong to all classes and races of the population, from Bushmen to persons of title, and the spot selected for the representation of the Episodes is on the shores of Table Bay, in the vicinity of the landing-place of the early Portuguese navigators, of Johan van Riebeeck, and of the English skippers who in the early days have visited this port. 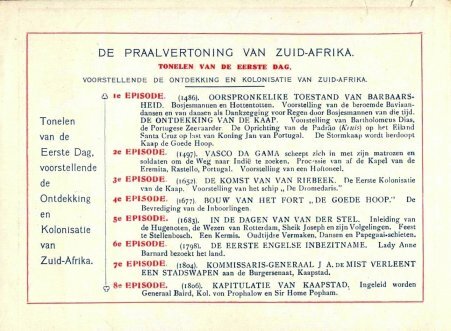 Synopsis of the planned Episodes. 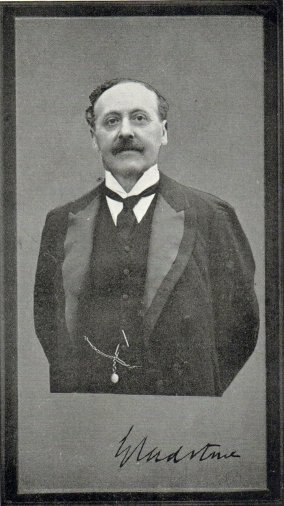 Frank William Thomas Charles Stevens. 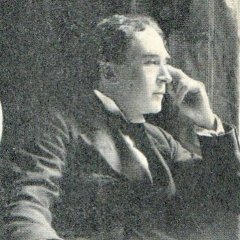 He became an actor, appearing 1904-06 at His Majesty’s Theatre where Sir Herbert Beerbohm Tree was actor-manager and it was at this time that he adopted the name Lascelles. 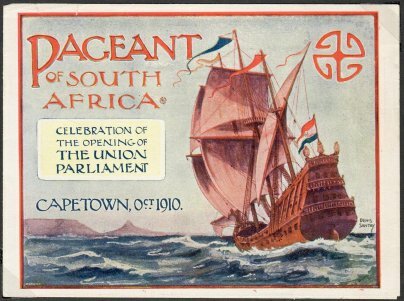 The Pageants of a country’s History may well be called the country’s Epic; and it is only fitting that such an Epic should be sung and played when that country, after grievous travail, comes to its own, when there are rejoicings far and wide in the birth of a great new Nation. 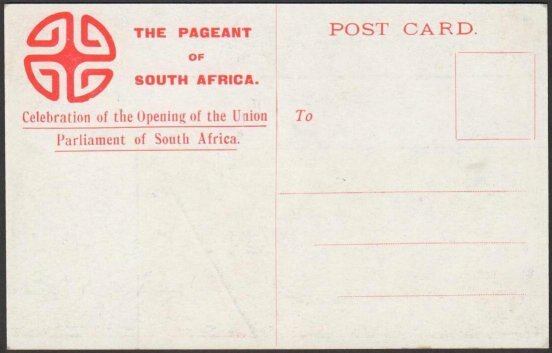 There is no more romantic occasion in the History of the British Empire than that which our Pageants celebrate, and few fraught with greater import to the Imperial nations. 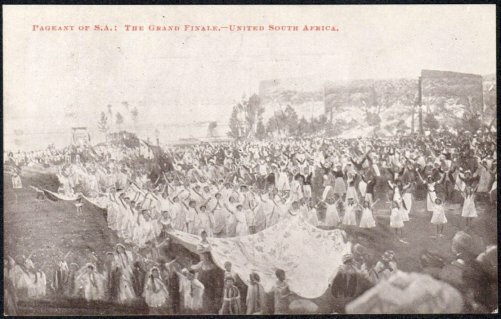 Hence it is but fitting, the footsteps being on the threshold of the New Life of this sun decked land of South Africa, that we should halt and turn our eyes back across the hills of time, to the long ago when the white man first set foot on these shores and to the great happenings since. 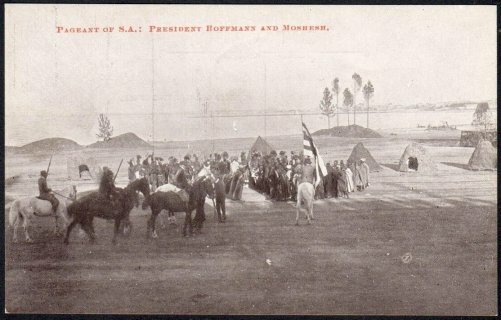 Love of country has ever been deep in the hearts of our pioneers, and in each of our great men, honoured by every race; it is the one thing by which we are glad, above all others, to remember them, and by which their names smell sweet in the dust; and it is in the love which her sons will bear towards her that the future of our country lies. 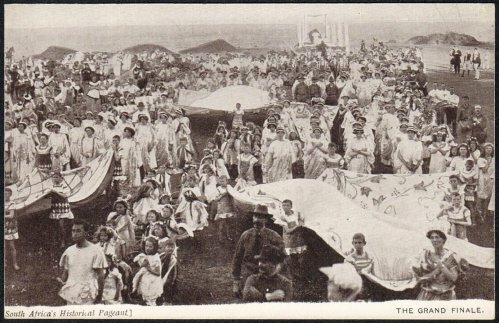 Were we to recall but a tithe of the great events or the noble deeds, or the names of but, half the heroes of old - statesmen, soldiers, evangelists, and cultivators of the country’s vast resources – our pageantry would take days and weeks in the showing, instead of a few brief summer hours. 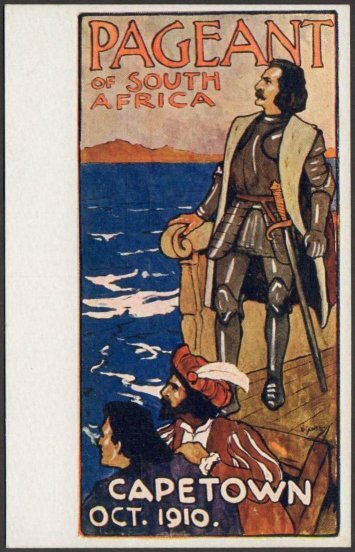 And many heroes there are, of administration, and of sword, and of pen, whose remembrance is too intimate for us to venture to recall them in our scenes. 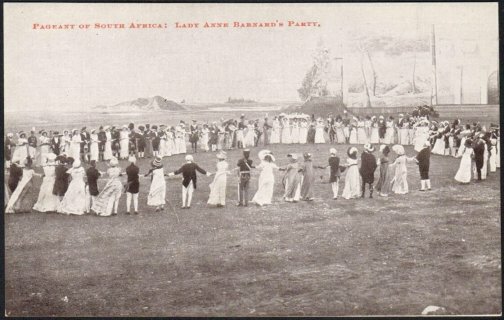 The committee of learned historians, to whom I owe so much, has done well therefore in selecting only the land marks, and of these only such as are most seemly to be shown forth in a spectacle. 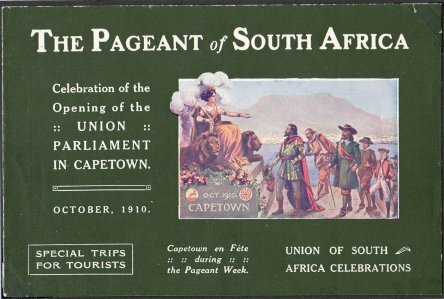 May they be an incentive to us to consider, in the light of the Future, the lessons of the past, and in considering them, to learn and understand; so shall these days of our pageantry live, bound up in the life of the Nation. 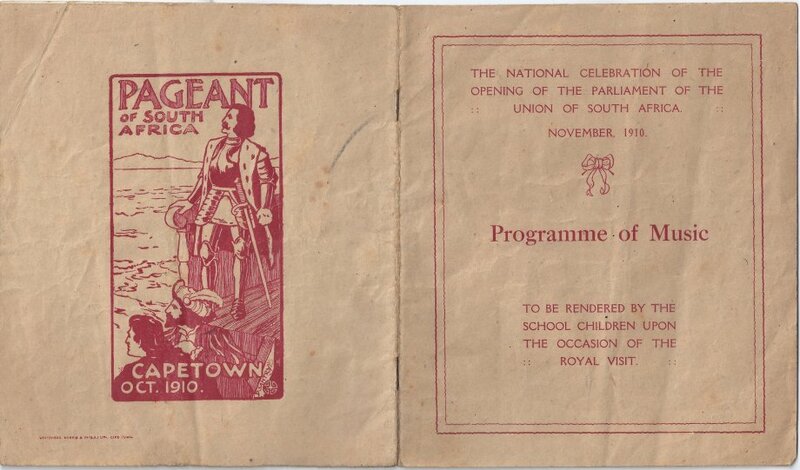 Three are folded providing a front & back cover plus two inside pages that includes the sequence of a two day programme. 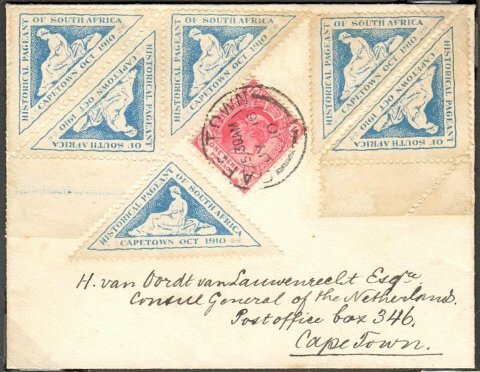 Two printed by S.A. ELECTRIC CAPE TOWN - Both front covers are identical and in English. 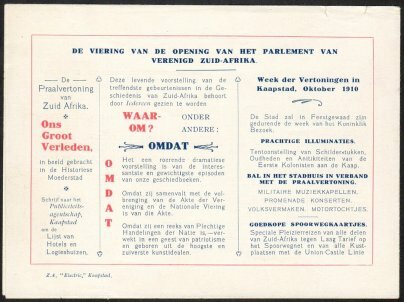 One is in English and the other is in Dutch. 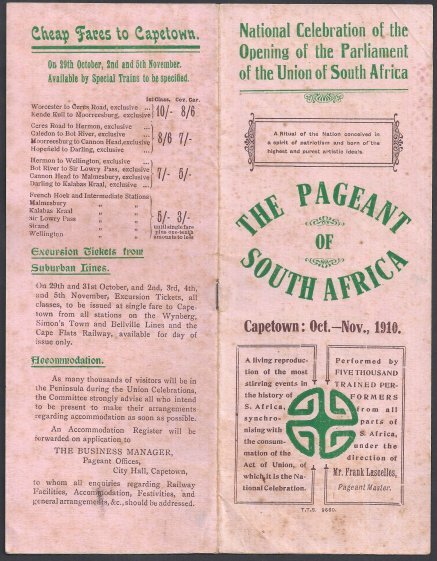 Printed by S.A. ELECTRIC CAPE TOWN - Front cover in English - inside pages and reverse in Dutch. 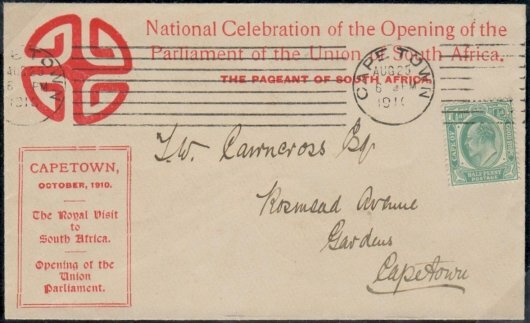 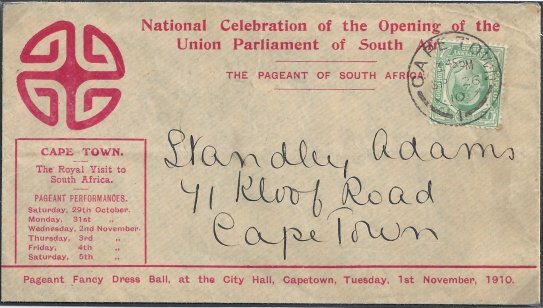 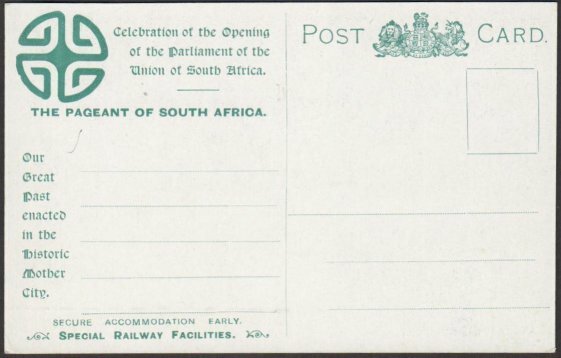 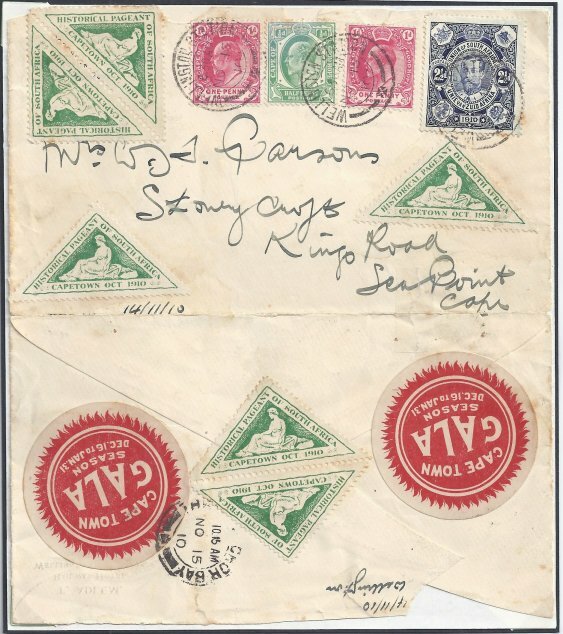 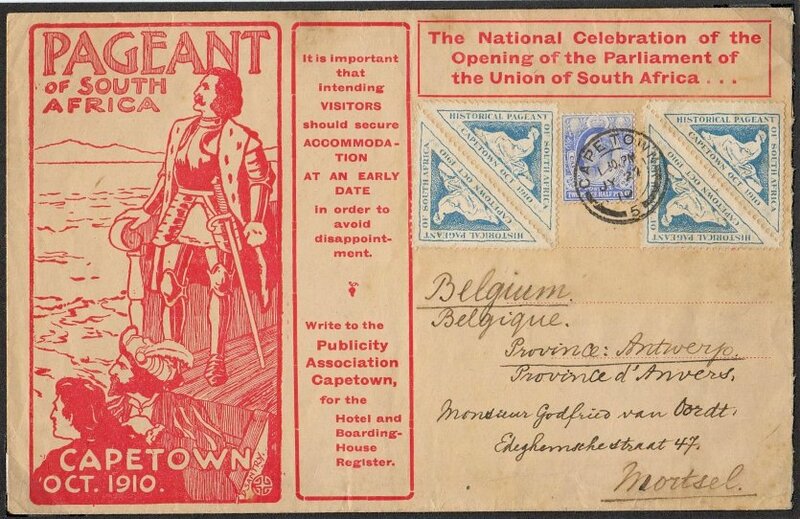 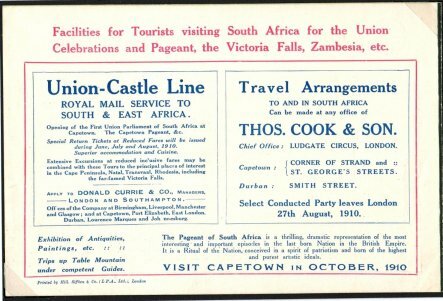 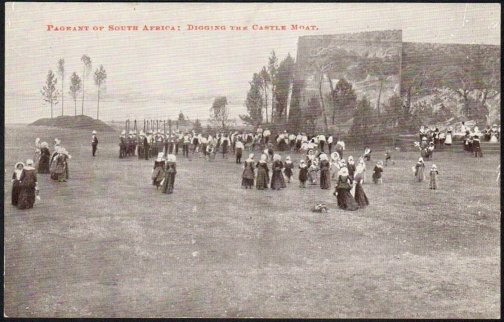 The Cape Town brochures were intended for people in South Africa and encourage them to write to the Publicity-Agent in Cape Town for a list of Hotels & boarding houses and there are offers of low tariff rail tickets and reduced fares from coastal ports onboard Union Castle Line ships. 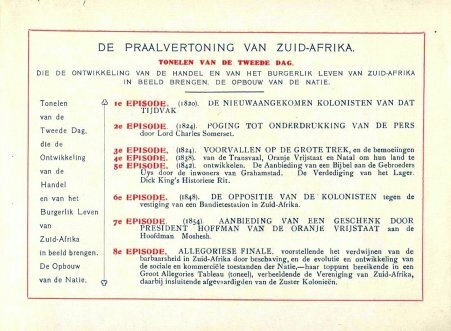 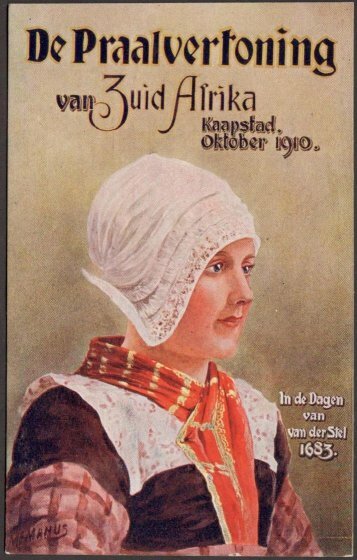 The brochure exclude the opening Episode in Part II COURT OF HOLLAND but this is included in a later six page programme. 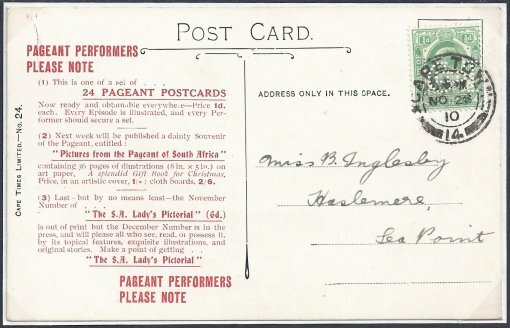 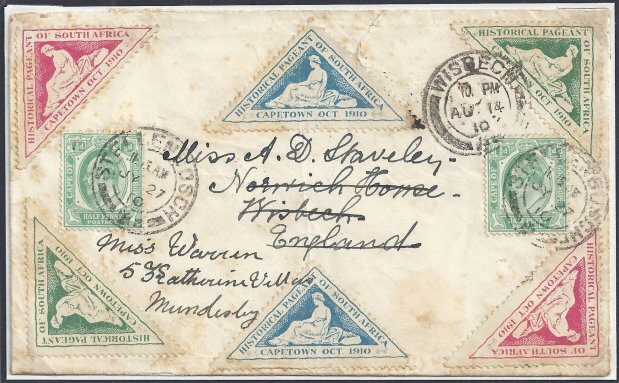 Pageant Entrance Tickets for 29th Oct. - 4th Nov. - 5th Nov.
1910 Pageant envelopes used for correspondence by the Organising Committee have some unknown reason a very low survival rate. 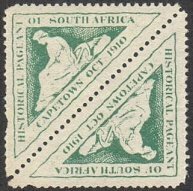 To date I have recorded three different designs, two of which are the only known copies, a third includes an unused and used example. 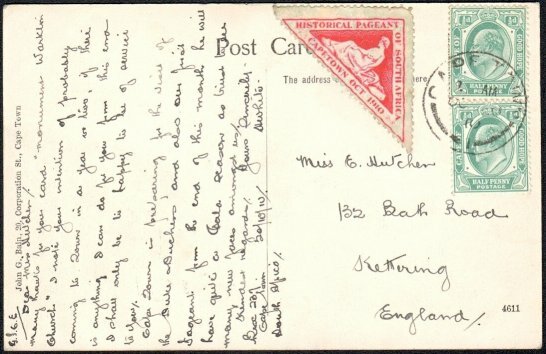 Back of Postcard written 6 April? 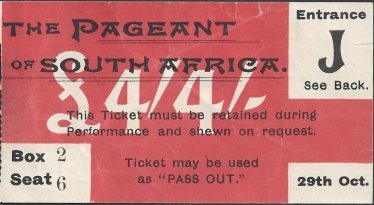 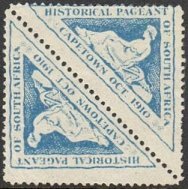 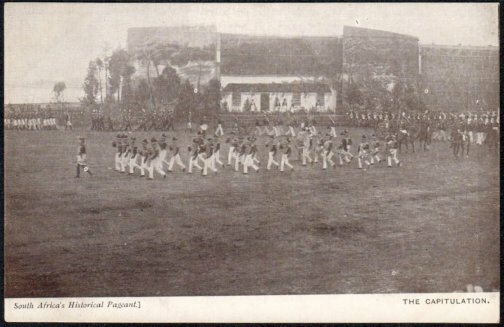 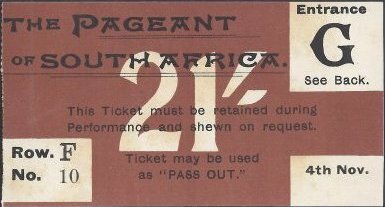 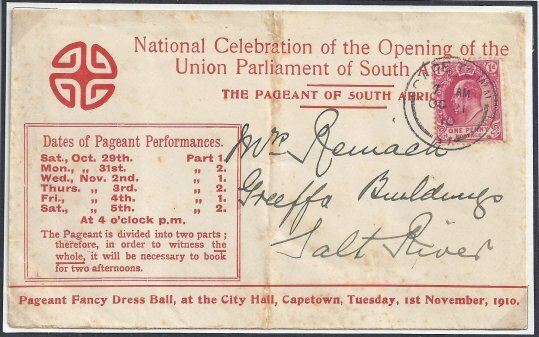 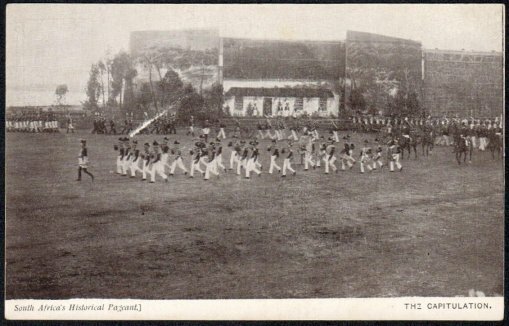 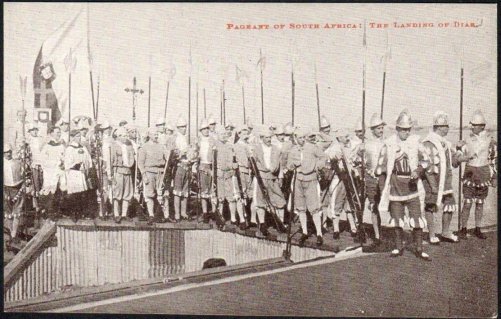 PAGEANT OF SOUTH AFRICA or PAGEANT OF S.A. 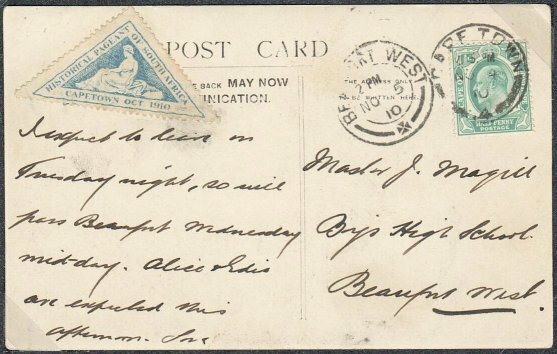 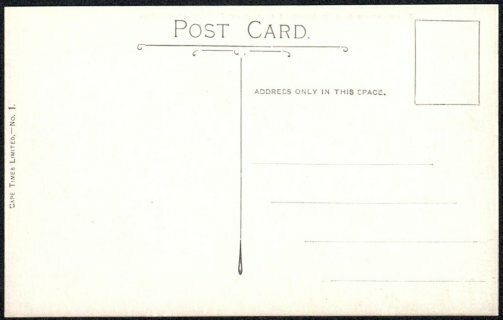 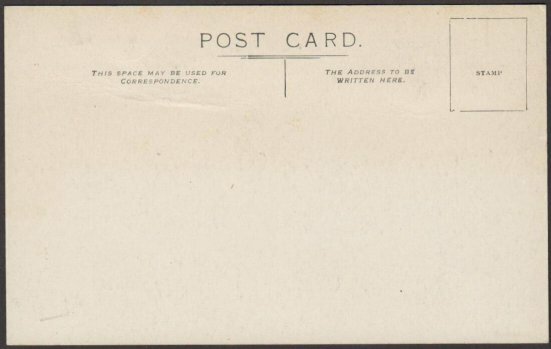 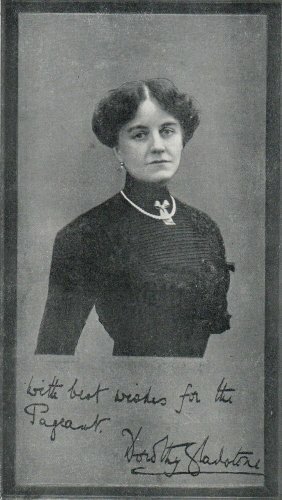 The Post cards are reproductions of photographs that were perhaps taken during rehearsals and probably produced in a hurry as the quality of the printing is not very good and I would not describe them as being attractive. 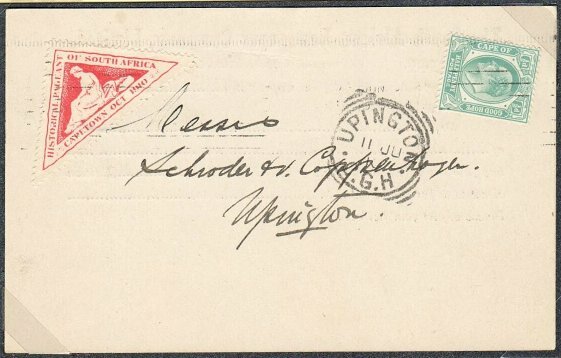 Ian Shapiro has a used example of No 24 and this card has in addition, a promotion printed on the message panel. 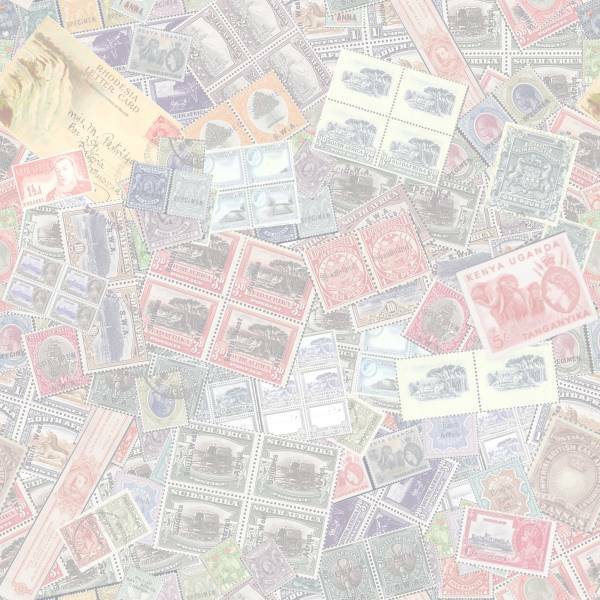 Now ready and obtainable everywhere – Price 1d each. 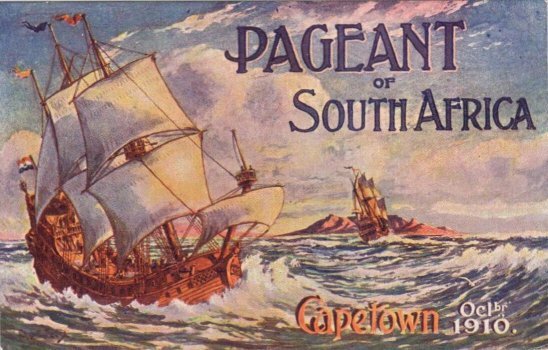 Every episode is illustrated and every Performer should secure a set. 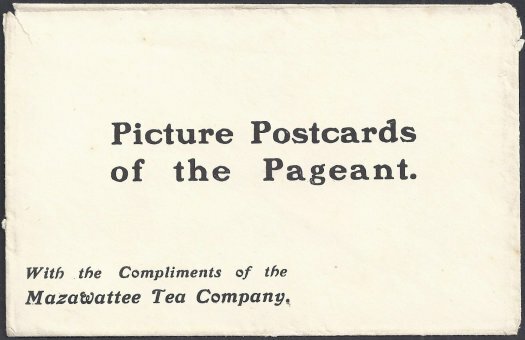 containing 36 pages of illustrations (8in x 5in) on art paper. 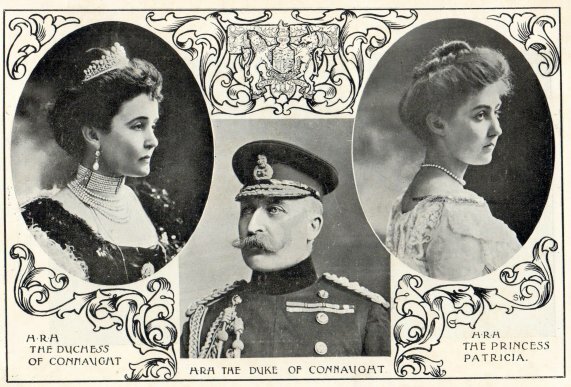 A splendid Gift Book for Christmas. 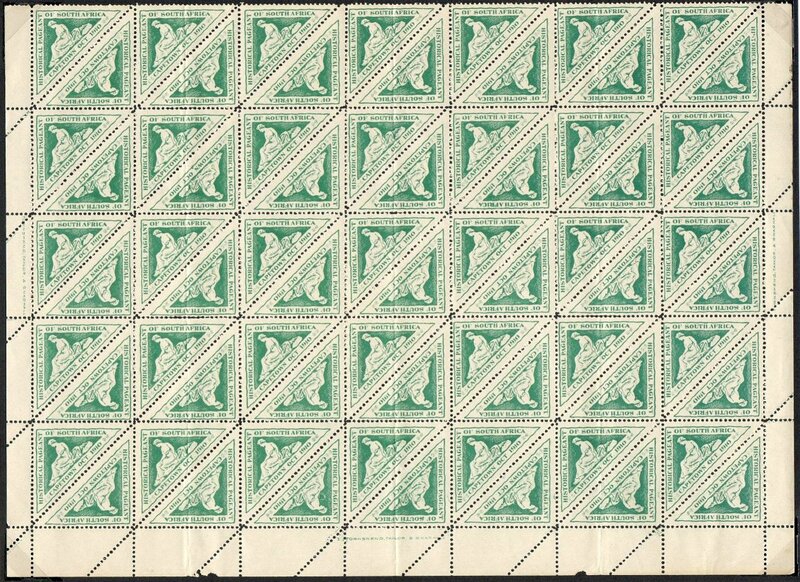 Price in an artistic cover, 1/-; cloth boards 2/6. 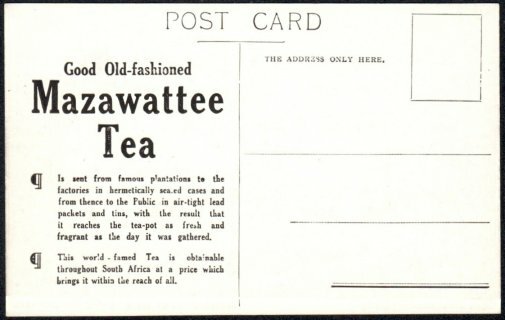 This Tea Company issued a set of six post cards contained in an envelope and the wording With the Compliments of the Mazawatte Tea Company suggests that the cards were a promotion and given away free. 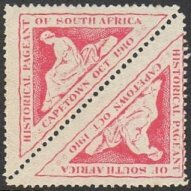 The quality of printing is superior to that of the Cape Times series and the cards depict six of the episodes being Cape Times No 6, 8, 9, 12, 15 & 18. 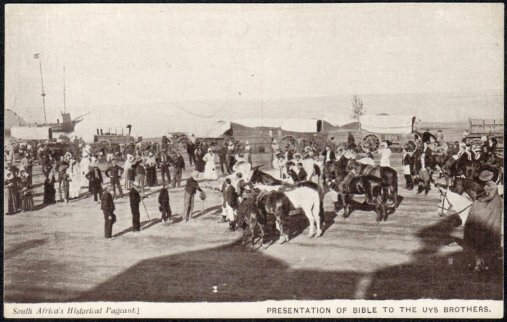 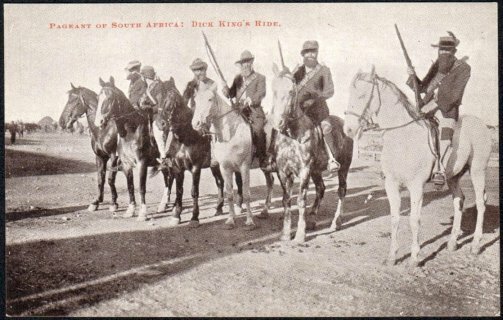 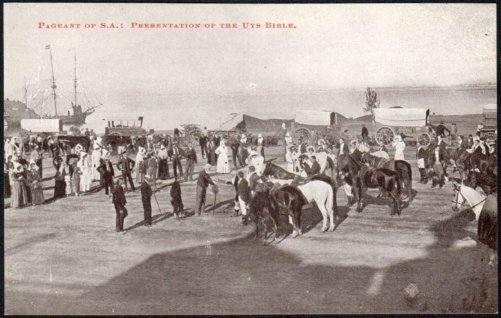 The photographs are quite different to the Cape Times cards except for The Bible Presentation to the Uys brothers which is almost identical.